In order to help make my life as mom, head chef and home manager a bit easier, I’ve been more intentional lately to cook things SPECIFICALLY for the freezer. It’s nice having a few batches of cinnamon oatmeal blender waffles in the freezer so the kids can simply reheat and serve themselves in the morning. And it’s nice having a batch of peanut butter oatmeal cookies, already baked in the freezer – to pull out when we want a little bit of sweet after dinner. And it’s REALLY nice when I can pack school lunches entirely from the freezer – these corn dog muffins are one way that’s possible! Tiff, corn dog muffins don’t sound healthy at all! Why in the world would you want to feed that to your kids if you’re eating real food? My friend, here’s the thing. STORE-BOUGHT corn dogs contain the stuff that gives me the heebie jeebies. But HOMEMADE corn dogs? Oh no. We have nothing but real food ingredients going on here! This is the elephant in the room, isn’t it? A lot of people don’t view hot dogs as real food. In fact, I have a very good friend who watched a documentary on how hot dogs were made and she’s sworn to never eat hot dogs again! I, on the other hand, haven’t seen the documentary and am perfectly content living in dark because of one thing: the 80/20 rule. The 80/20 rule basically says that 80% of what you eat should be healthy and the other 20% can be less than stellar. In practice though, we eat closer to 95/5 in my house, especially since completing the Whole30 as a family. We’ve made significant strides in cleaning up what we eat over the years, so it’s hard to even say that the last 5% of our diet is unhealthy. Grass-fed Beef, Water. Contains Less Than 2% Of The Following: Sea Salt, Paprika, Dehydrated Onion, Spices, Nutmeg Oil, Celery Powder. Considering these are ingredients I already have in my own kitchen, I’m pretty much okay with buying a pack every now and then! I wish that that lovely coating surrounding hot dogs was fancier than cornbread, but it’s not! I absolutely LOVE my cast iron skillet cornbread recipe, but the batter I used for these cornbread muffins is slightly different. 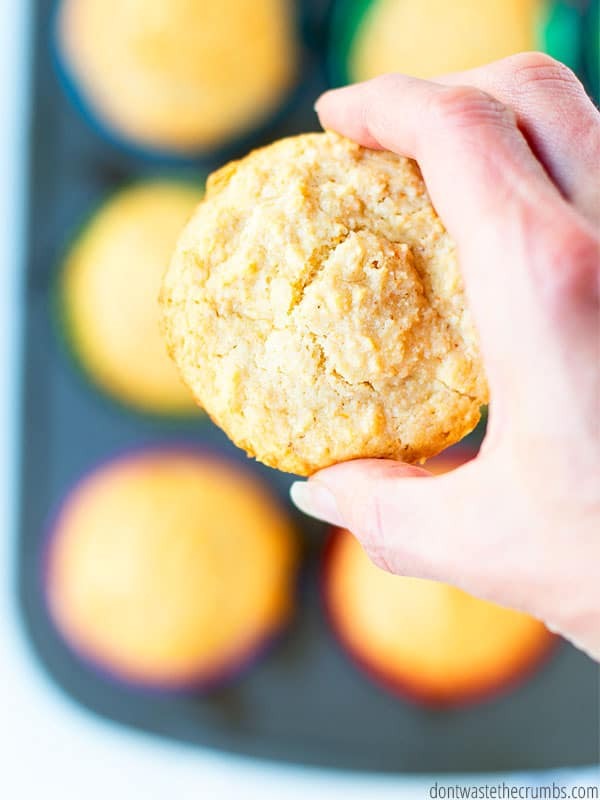 My skillet cornbread recipe is designed to be super moist and light in its own right, but I wanted a batter that would rise a bit more for these muffins. The differences are minimal, and I’m 90% sure you could easily substitute whatever cornbread recipe you’re currently crushing on instead of mine, but I wanted to go with a tried-and-true version to offer you guys. 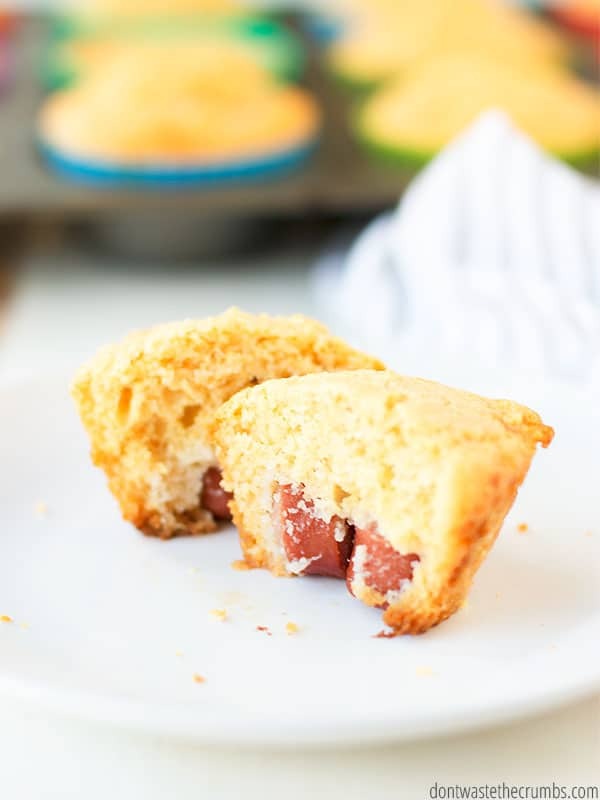 Quite possibly the best part about these corn dog muffins is that they’re freezer-friendly! I’ve made these several times, exclusively for the freezer, and the kids love them just the same. I pull a couple out of a freezer-safe container when I make lunches in the morning and they’re thawed in time for lunch. Be sure to not over mix the batter. Over-mixing will give you a muffin that doesn’t rise well and tastes dense. I cut each hot dog into 8 pieces and then put 3 pieces in each muffin cup. I did this so that each bite would give a chunk of hot dog. You don’t have to go through the trouble if you don’t want to. 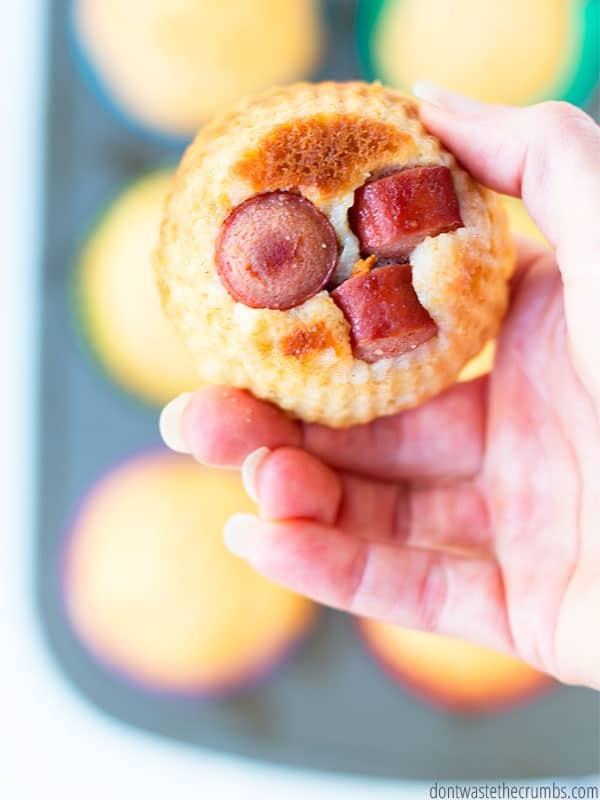 The recipe as a whole makes 16 corn dog muffins, so you can short cut and just cut each hot dog in half (although they might stick out a bit at the top!). Corn dogs are traditionally served with ketchup or mustard, but don’t forget that they’re CORNBREAD… meaning a slather of butter isn’t off limits either. 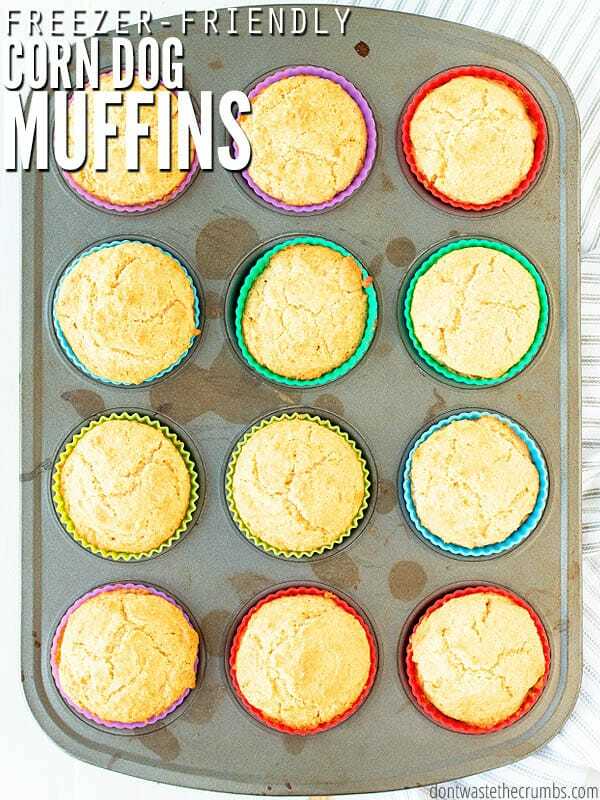 These can be made gluten-free by substituting your favorite all-purpose GF flour for the all-purpose flour. If you’re vegan, sub your choice of no-meat hot dogs, a non-dairy milk and melted coconut oil. For an extra fun treat, consider adding 1/4 cup shredded cheddar cheese right into the batter before baking! 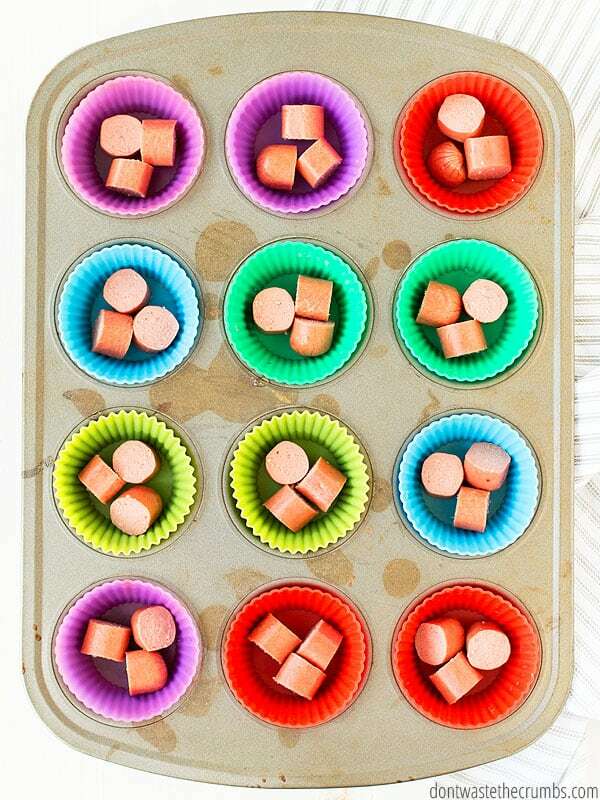 Preheat the oven to 375F and line a muffin tin with 16 muffin liners. I really like these silicone muffin cups because they're reusable, easy to wash and the corn dog muffins just pop right out of them! Measure the apple cider vinegar into a glass measuring cup. Add milk until you reach the 1 cup line. Stir well and let it sit for about 5-7 minutes while you continue working on the recipe. In a large mixing bowl, combine the melted butter, honey (optional) and eggs. Whisk well. In a small bowl, combine all the dry ingredients and whisk together. Set aside. Cut your hot dogs into small pieces. I like to cut each hot dog into 8 pieces and then put 3 pieces into each muffin tin. Feel free to simply halve each hot dog if you'd like, but the hot dog might stick out from the top! When the oven is preheated, add the dry ingredients to the wet ingredients. Immediately add the milk mixture and stir together until JUST combined. 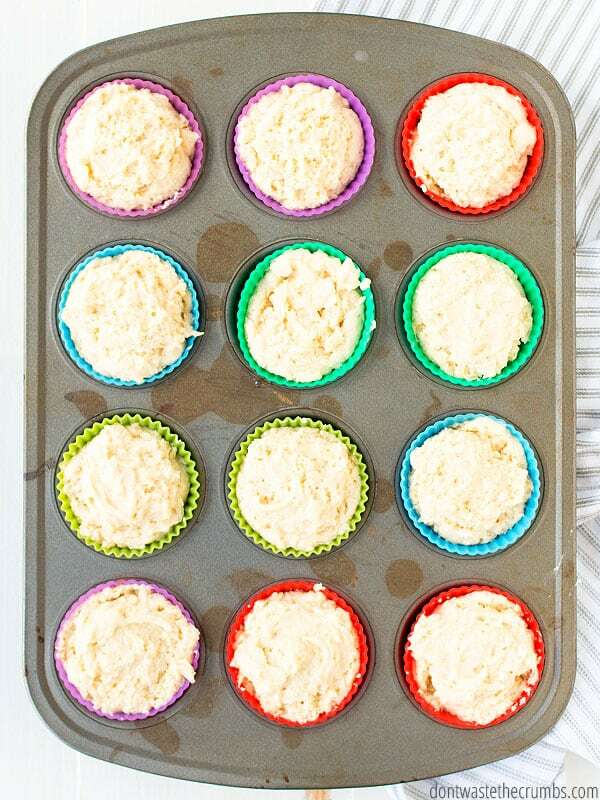 Divide evenly between the 16 muffin cups and bake until the tops are just golden brown about 15-17 minutes. Cool completely before storing in the freezer. Homemade Corndog Muffins are amazing! I use these silicone baking cups. They make muffins SO easy! I also like to use this cookie scoop so I get even amounts of batter in my muffins. Beyond cookies and muffins, I use my scoop for pumpkin donuts, Italian meatballs, and portioning yogurt to freeze! Freezer cooking is one way that I make school lunches easier. If you need some fresh ideas or a break from coming up with ideas, use this free two week school lunch meal plan. It will make your kids happy and your mornings easier! How do you feel about hot dogs… love them? Or hate them? And do you generally follow the 80/20 rule? Leave your thoughts and ideas in the comments section below! Nitrate-free meats: I would love if the celery powder used to substitute for nitrates in nitrate-free meats really made them nitrate free! But I looked into this a bit and found that celery powder is loaded with nitrates – enough for me to see “nitrate-free” labels as a possible marketing ploy, and this made me go back to buying just “normal” meats. If it’s grass-fed or organic, or even vegan, that’s a plus – but I don’t want to buy nitrate free meats when it simply is not true. Hi Christine! It’s my understanding that nitrates occur naturally in celery powder, and while it certainly doesn’t make food healthier, it is an natural option versus the additive. In everything, moderation! Absolutely, everything in moderation! I don’t think anyone reading your blog is eating hot dogs 24/7. Lol – What a cute meal idea for the lunchbox or a quick weekday family meal! We are attracted to your blog because you give us tips and tricks for eating well on a budget. Thank you for your time putting all this together for us. Also, Tiffany, how come do you not specify organic or GMO free corn meal. Or…perhaps I missed it! Please advise. Thanks!! These muffin look so delicious. Thanks for sharing the recipe. My son likes to eat tofu hot dogs, These could be put into the muffins instead of meat.